We teach our patients special exercises designed just for them to help strengthen and correct their own unique problem. The session is done in our state-of-the-art training studio specifically designed to meet each and every patient's needs. 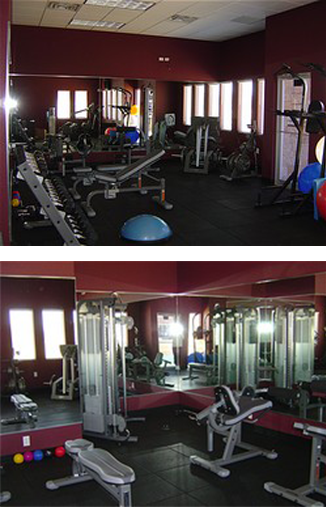 They are conducted one-on-one with our Rehab Director and/or Rehab Therapist. The following is a sample regimen you could expect to perform if you were in the right stage of healing and active correctional rehab. These exercises can improve the effectiveness of your spinal correction by as much as 30-40%. This enhances the treatment process and helps maintain healing benefits, as well as reducing the likelihood of future problems. You start this exercise the same way like the partial sit up, by lying on the floor with a pillow supporting your neck. Now bend both knees (keep your feet on the floor). Begin the exercise by drawing one of your knees to the chest, using both hands (only one foot is now on air). Hold to the count of 10, then slowly release it to the position before. Do this 4 - 5 times before doing the same thing with the other leg. You'll feel that the whole back gets stretched. That is good thing, since we have been making the back shorter all day by sitting incorrectly. After that, slowly bring back both feet to the middle and repeat the same step, this time going to the left. Repeat the entire thing for 4 - 10 times. The Cat-Camel is intended as a motion exercise-not a stretch-so the emphasis is on motion rather than "pushing" at the end ranges of flexion and extension. Repeat 12-15 times.